Schuchat’s long and distinguished career in public service began in 1988, when she joined the CDC as an epidemic intelligence service officer. Since then, she has held a number of leadership positions, including: acting CDC director from January - July 2017 and again from January - March 2018; director of the CDC’s National Center for Immunization and Respiratory Diseases (2006-2015); and chief of the Respiratory Diseases Branch from 1998-2005. 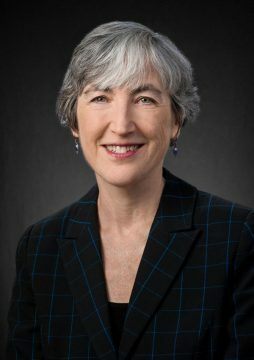 Over the years, Schuchat has played key roles in a number of CDC emergency responses—she served as chief health officer for the CDC’s 2009 H1N1 pandemic influenza response, headed the CDC’s response to the SARS outbreak in Beijing in 2001, and supported the Washington, D.C. field team during the 2001 anthrax response. Schuchat’s global health initiatives have included working in West Africa on meningitis, pneumonia, and Ebola vaccine trials, and in South Africa on surveillance and prevention projects. She has authored or co-authored over 230 scientific articles, book chapters, and reviews. In recognition of her contributions to public health, she has received USPHS Meritorious Service Medals, the American Public Health Association’s Maternal and Child Health Young Investigator Award, and the USPHS Physician Research Officer of the Year Award. Schuchat was elected to the National Academy of Medicine in 2008. A graduate of Swarthmore College and Dartmouth’s medical school, Schuchat completed her residency and chief residency in internal medicine at New York University’s Manhattan VA Hospital. After completing 30 years of service in 2018, she retired from the Commissioned Corps of the USPHS at the rank of Rear Admiral.